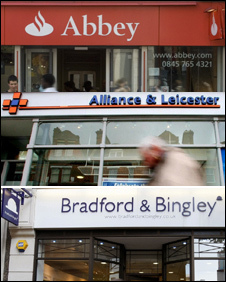 Spanish banking giant Santander is to rebrand all of its major UK High Street brands - Abbey, Alliance & Leicester and Bradford & Bingley. A total of 1,300 branches will have their names changed to Santander by the end of 2010, in a £12m move. Any customer of Abbey, Alliance & Leicester or Bradford & Bingley savings will be able to carry out transactions in any of Santander's UK branches. But one analyst told the BBC the move could be risky. Santander is the second-biggest banking group in the world after HSBC. Will bank rebranding plan pay off? It said it hoped to save about £180m by integrating the three businesses, and that the overhaul reflected the group's policy to operate under a single brand - which is already found in more than 40 countries. Santander has already incorporated its flame logo into the Abbey branding, and it said that customer feedback suggested its brand would be welcomed in the UK. "Customers trust us as a global brand and they feel very safe about their savings," said António Horta-Osório, chief executive of Santander's UK businesses. "It's important for customers who travel around the UK to have 1,300 branches to transact with - and they will have the same product and the same people facing them in the branches." The move would also allow the UK business to use the "expertise and product developments from Santander's global business," he added. Best known ad slogan: "Get the Abbey habit"
The first name changes will begin in June, with Abbey credit cards being rebranded, while the renaming of branches will begin next year, with Abbey and B&B first to be overhauled. However despite the savings it anticipates making, banking analyst Leigh Goodwin said that the policy was a risk and, in his view, a mistake. "Abbey has good value as a trusted brand in the mortgage and savings arena," he said. "Staff will be upset and there will be a potential loss of customers." Santander gained a foothold in the UK banking market in 2004 after buying Abbey for about £8bn, in Europe's biggest cross-border bank takeover. The deal offered Santander control of Britain's second-largest mortgage lender, with 741 branches and 18 million customers. Best known ad slogan: "Be a smarter investor with Alliance & Leicester"
The Spanish bank saw further expansion opportunities in 2008, as some UK banks were severely threatened by the global financial crisis. It bought Alliance & Leicester in a £1.3bn deal aimed at reducing funding pressures on the UK bank and strengthening Santander's local business. In September, the UK's biggest lender to landlords, Bradford & Bingley, was taken over by the government after the credit crisis had shut off its funding. Santander stepped in and paid £612m to take control of 197 Bradford & Bingley branches and £20bn in deposits. In December the group said it was cutting 1,900 jobs across the UK - but has said the rebranding will not lead to branch closures. Bradford & Bingley still exists as an entity and is owned by the Treasury. Santander's specialist brands, including the internet bank Cahoot, will retain their identities. UK banks owned by Santander currently operate under two banking licences. One covers Abbey, Bradford & Bingley and Cahoot. The other relates to Alliance & Leicester. This means that savers are 100% covered by the Financial Services Compensation Scheme for up to £50,000 across Abbey, B&B and Cahoot combined. In addition, they are also covered for up to a further £50,000 with A&L. Santander says this will remain the case up until at least mid-2010, because Abbey and B&B are being rebranded first - meaning that A&L will still be running as a separate business under its own name and its own licence.